Crime, Aboriginality and the Decolonisation of Justice explores contemporary strategies which might reduce the extraordinary levels of imprisonment and victimisation suffered by Aboriginal people in Australia. These are problems that continue to rise despite numerous inquiries and reports. 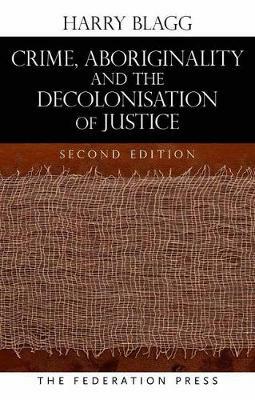 Harry Blagg disputes the relevance of the western, urban, criminological paradigm to the Aboriginal domain, and questions the application of both contemporary innovations such as restorative justice and mainstream models of policing. He also refutes allegations that Aboriginal customary laws condone violence against women and children, pointing to the wealth of research to the contrary, and suggests these laws contain considerable potential for renewal and healing. This book maintains that unresolved questions of colonisation, decolonisation and sovereignty lie at the heart of debates about criminal justice in post-colonial Australia. It explores the potential for ‘hybrid’ initiatives in the complex ‘liminal’ space between Aboriginal and non-Aboriginal domains, for example, Aboriginal community/night patrols, community justice groups, healing centres and Aboriginal courts. This new edition covers emerging issues such as Foetal Alcohol Spectrum Disorders (FASD) and reports on the consequences of the Commonwealth Government's contentious 'intervention' in remote Northern Territory communities in 2007.